Before I start, let me ask you a quick question here: would you work hard at giving your work away for free? Maybe you wouldn’t, because your father told you “Don’t work for free”, right? Here’s the real truth: not only these people are making money, but they are also making staggering money just by giving away free stuffs! They give something away for free, which opens up a huge buying opportunity. 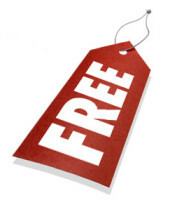 If you ever read the latest book “Free: The Future of a Radical Price” by Chris Anderson (the fame of long tail theory), you will get the idea that everything will be free – ultimately; and $0.00 is the future of business. And in this post, you will clearly see where the magic happens in the giving process, and learn the exact steps to take unfair advantage of this phenomenon and make decent profits. In case you don’t know, let me introduce you to Cialdini’s law of reciprocation: people generally feel obligated to reciprocate when they receive gifts from others. The law states that whatever you do will be returned back to you. If you can give away value and help people, you will get far more than you gave. The 99% of people who fail to make money online because they don’t follow this law. They simply try to hard sell to everybody. And if you can give something to people first, the obligation for people to give back will massively boost your selling and marketing efforts. Give people some free gifts (ANY free bonus will do as long as it’s related to the offers you are promoting) a few days BEFORE you make your pitch or ask for money. The law of reciprocation leads them to support you by buying your products. Continue to give away value and build a sense of reciprocity. Actually, it’s just a “2-step” system. Give, and take. This is a give-and-take process creates an obligation for people to give back when a gift is given. If you can give something valuable to people first, they will feel that they have the obligation to buy something from you to support you when you have something to offer. You offer value FIRST, and then giving them the option of getting even more value by following through on a recommended action. For example, let’s say you write an excellent report and offer it to your subscribers as a free gift. Your subscribers read the report and really love it. What will they think? They will be thinking if the free report is so good, then your paid product must be even better! Ka-ching, sales flood. This is the law of reciprocity in action. If you can offer people something valuable first, people will help you in all means and give you the money you want, and you end up making more money than you expected. “Giving is better than receiving, because giving starts the receiving process”. Actually, now Lee is making big bucks just by giving away some really good stuffs. I urge you to grab his freebie yourself and see how his system works in action. Have You Ever Got Scammed by “Internet Marketing Gurus”? In the short time I have been following your advice, your newsletters have already helped me immensely. Keep ’em coming. I know why is it profitable to give away free stuff. You haven’t directly stated the reason but I perfectly understand. List building is still the most important. That’s funny that you mention Lee McIntyre in this article. He’s the first thing I thought of when I read your title! I loved the way you put a different spin on something I thought I already understood. Thanks! Good post, we can find almost everything on the internet for free, whatever we want, as long as we keep trying to find what we want. The information on the internet is no limit, everything there, even we can find operating system for free, the best browser firefox is 100% free, thunderbird is free, open office and a lot of more free stuff, and you said, to get return, if we can give something valuable to people than they are going to buy something or give us something.